Get Higher yield, quality and functionality. Prevent enzymes from becoming active. 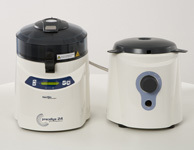 Cryolys prevents increasing of temperature during lysis process and enhances efficiency of molecular extraction leading to premium quality analysis. Important: Cryolys has to be connected to compressed air (network or canister). Lab air network needs to provide compressed air at a minimum of 4 bars, with 120 Liter/minute flow.